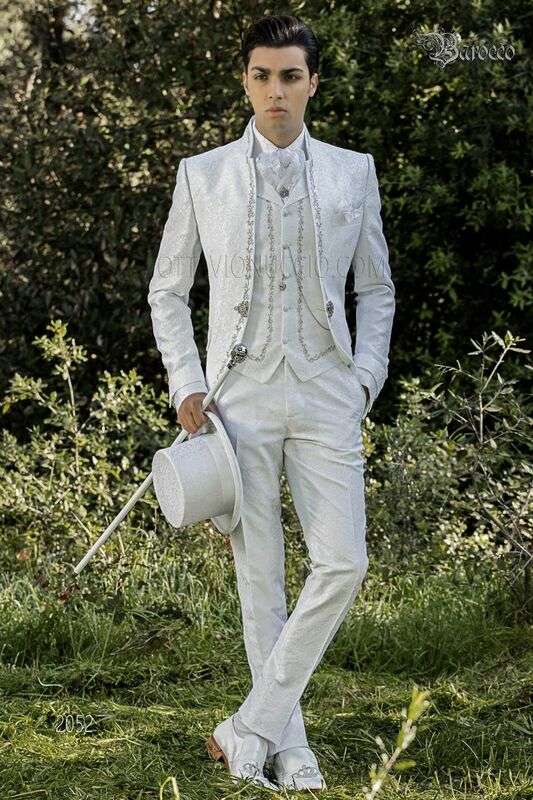 White brocade italian luxury groom suit with silver embroidery and mandarin collar. Silver embroidery on the front, rear... White brocade italian luxury groom suit with silver embroidery and mandarin collar. Silver embroidery on the front, rear, collar and pocket flaps. Single rhinestone frog closure. Redingote-style seams and single vent at back. Angled flap pockets. Waistcoat with lapel made from white brocade fabric with silver embroidery. White brocade waistcoat with vintage Baroque lapel. 5 covered tonal buttons and 2 double welt pockets. Silver floral emb... White brocade waistcoat with vintage Baroque lapel. 5 covered tonal buttons and 2 double welt pockets. Silver floral embroidery on the front and back lining with elastic band to adjust width. Shirt made from white jacquard microfibre with tonal lace on the standard collar and cuffs. Concealed placket with butto... Shirt made from white jacquard microfibre with tonal lace on the standard collar and cuffs. Concealed placket with buttons. Pointed convertible cuffs with patterned button and twin cufflinks buttonholes.